Many blog readers are asking to provide selenium online training session and qa training session. Also peoples are asking questions and posting comments when they learn selenium or any other tool and face any problem. Well.., To be honest with you guys, It is not possible for me to provide online selenium training or software testing training to any individual due to my own work load and preparing free software testing tutorial on different tools and topics for my blog readers. 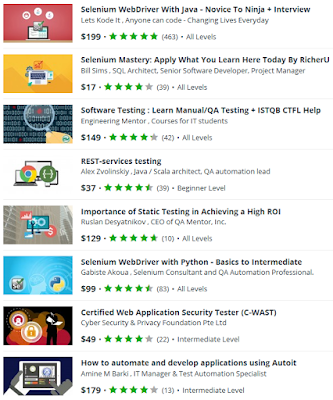 I searched online and found many sites who are providing software testing training to learn automation testing tools like selenium training, qtp online training, soapui training. 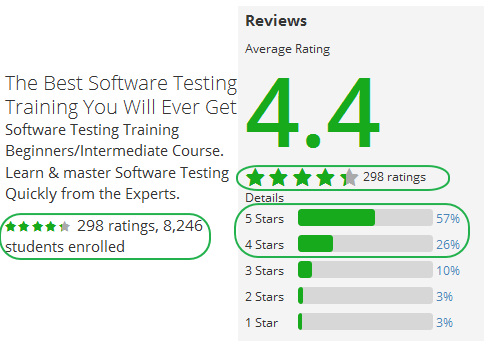 But good site where i fond the best software testing course is @ UDEMY. You will find many courses on manual software testing course, selenium training, mobile automation testing tools training, loadrunner training, jmeter load testing training, soapui training, appium ios training, database testing training, REST testing training, Security testing training, Bugzilla, Jira, Cucumber, AutoIT and many more courses on UDEMY. There a more than 80 courses on different tools. I have reviewed different courses and find list of best courses on different topics. You can subscribe these courses if you are interested in paid training courses. Why I Recommend Online, Video Courses? At the beginning of my software testing career, I was working on manual testing only. After working as a pure manual tester for 1 year, I decided to move in the automation testing industry as there were many opportunities and big salary hike in the automation testing industry. But the big question was how to learn automation testing tool and get a job? There were two option with me to learn automation testing 1) Either learn from paid online video tutorials with proper guidance and help of a tutor, or 2) learn from free online tutorials yourself without any guidance and help. Finally, I decided to learn automation testing myself through free online tutorials to save some money. So I started learning selenium from online free tutorials when gets free time. But at that time, there were very limited online free resources to learn automation testing tools. So it was very hard for me to understand from where to start and what next to learn. So It was consuming too much time for me to learn selenium and prepare basic test automation scripts due to the lack of proper learning guidance and help. Finally, after a long self learning journey (Almost 2 years), I got job in pure selenium automation testing. But after getting a job also It was not easy for me to work on real selenium projects due to the lack of proper knowledge. At last I realized that if I had chosen to learn selenium through paid online video courses (without considering little fee of the paid video tutorial) then I had learned it very early and got the job easily because online video tutorials will teach you everything steps by step with practical examples and you can view it on your screen. Also tutor can help you to resolve your issues and you can ask them your queries. So if you really want to learn selenium and getting job fast, I recommend you video tutorials compared to self learning from online free resources. Yes, you have to pay little amount for video tutorials but it is worth. Bellow given list of courses is based on best ratings provided by the students who has subscribed course. There are many selenium online training courses. I found bellow course on selenium which is popular and best rated. More than 3500 Students enrollment. 450 Positive ratings(82% 5 Star, 14% 4 Star ratings). 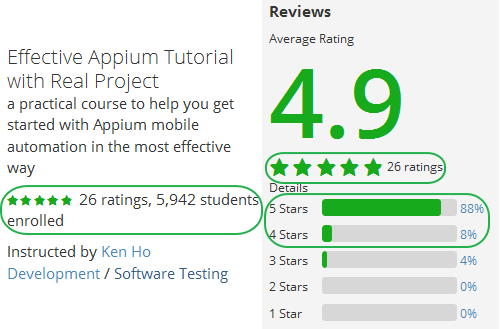 Appium is one from the many mobile automation testing tools. If you wants to make your career in mobile automation testing then you can learn appium ios and android. You will find many appium courses but bellow given course is amazing and most Recommended as per student's ratings and enrollments. More than 5940 Students enrollment. 26 Positive ratings(88% 5 Star, 8% 4 Star ratings). SoapUI is web service testing tool. Also you will find many online soapui training courses but best and Recommended course is given bellow. More than 312 Students enrollment. 71 Positive ratings(55% 5 Star, 37% 4 Star ratings). If you wants to make your career in softwre testing then you must have to join any qa training. Bellow given course is best software testing course where you will learn manual testing, Test Cases, Test Scenario and Test Plan, different test management tools like JIRA, Bugzilla, and qTest. I Recommend bellow given software testing training to you if you are interested to learn everything about manual testing. More than 8245 Students enrollment. 298 Positive ratings(57% 5 Star, 26% 4 Star ratings). List of Online JMeter Video Tutorials. List of Online Security Testing Video Tutorials. If you are interested in development language courses then you can view THIS LIST which are best rated and subscribed by students. Note : All above suggested courses are based on number of student's enrollment in course and reviews and ratings provided by those real students. I am suggesting you to read full course details carefully before purchasing any course. Also each course have 2 to 3 free preview videos so you can view them to check video quality and content before purchasing course. We are just suggesting you these courses but final decision is yours to purchase a suggested course or not. I tried with this coupon code today only but its experired in the evening .Can i get one more same couponcode for $15. Yes, It is expired. Now you can use coupon code APRIL034 to get 30% discount. Open above given any course. Apply coupon code APRIL034 during checkout. Let me know if it not works for you. please let me know when there is an off of $15 for the course :Selenium WebDriver With Java - Novice To Ninja + Interview. OK.. Let me know your email ID. I will let you know if get coupon of $15. But now i think there is no chance of $15 coupon because on april 4th, they have changed rules so max coupon can be created of 50% off only. For June/July 2016 is there any coupon ? coupon code 'APRIL034' has expired. 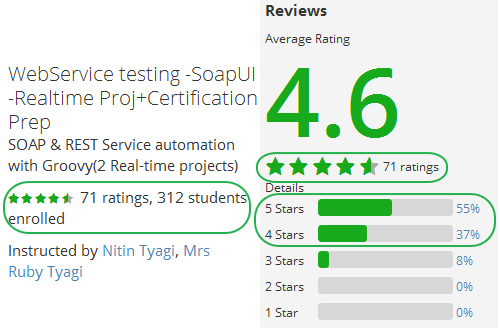 Is there any other code for WebService testing -SoapUI course. Give me your email ID and course which you wants to purchase. I will send you link with coupon code to get discount. Any coupon code to get 50% off ? can you please update a tutorial of installation of mac os on top of windows pc using virtual machine (VM) for appium testing purpose . Can u please update on how to install mac os on top of windows pc using Virtual Box (VM) for running appium ios tests on both physical and emulator purpose . Please post tutorial on winium tools as well so that we can automate windows phone applications as well. I would like to take the Course - "Selenium WebDriver With Java - Novice To Ninja + Interview".Any coupon for Dec2016 please ? It's only $10 now. Offer will be expired tomorrow. Hi There, need a promo code for Jan 2017 please. 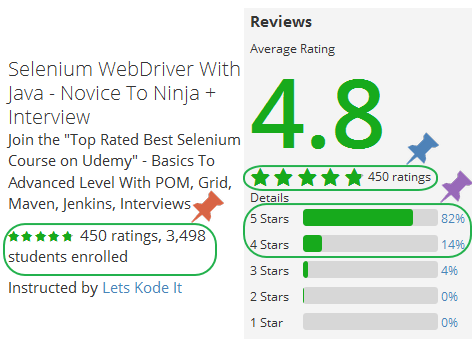 Selenium WebDriver With Java - Novice To Ninja + Interview. Hi, I would like to take Selenium WebDriver With Java - Novice To Ninja + Interview, any coupon for March2017 please ? selenium web driver c # will you share tutorial videos? Hi, thanks for advice and tutorial. Pls can you share coupon code if you have for udemy courses ?